Christine Evelyn Volker became intrigued by foreign cultures at an early age, which propelled her to study Spanish, German, and Italian. After pursuing an MLS and an MBA, she was drawn to international banking and became a senior vice president at a global financial institution. Her career brought her to Italy, where she immersed herself in the language and made frequent visits to Venice. Venetian Blood marks a return to her roots in the humanities. A native New Yorker, she resides with her husband in Richmond, California, where she heads a local library non-profit organization and writes about environmental sustainability. She is currently at work on her second international mystery, this one set in the rainforest of Peru. Any story with a premise set in Venice should make for an interesting read. That city has so much to offer in terms of rich history and culture. A perfect setting for a murder. The protagonist, Ana Lucia is a investigator with the American IRS with an Italian heritage. She has an affair with Count Sergio whom she later investigates for money laundering. He is murdered and the police suspect Ana of committing the crime as she is seen fleeing the scene of crime. With her friend Margo in tow, Ana embarks on a dangerous mission to uncover the murder in the process of which she is subjected to grave danger. The setting and the summary sounds very enticing. With all that art and rich history, Venice offers a perfect backdrop for a passionate and intense story. The writer hasn't really capitalized on this fully. The romance angle or a rebound kind of a story line I expected for Ana was kind of lacking. However, the mystery and the crime by itself compensated well for the lack of this. The whole part of the story where the murder is investigated piece by piece is just perfect. It is a slowly peeled mystery with a bang of an ending to go with. The narration and the characterization was just perfect. Personally, I would have preferred a bit more intense romance than what was there in the book. Venice tends to bring out that romantic side in you! Anna decides to take a trip to Venice and visit her friend Margo in order to get her mind off of her impending divorce back in the states. Instead, Anna finds herself in a romantic entanglement with serious complications; furthermore, she is the prime suspect in a murder when the man she slept with is found murdered. Anna's job at the US Treasury is put in danger when she begins to look into the life of Count Sergio Corrin, Anna finds a sordid past entangled with many other Venetians who just may want to kill the man. While Anna desperately searches to uncover any information to clear her name, she reveals some other secrets of the closely-knit Venetian people. Meanwhile, the person who murdered Sergio is still on the loose and is attempting to throw Anna off the trail. An exciting and suspenseful murder mystery set in the sensuous and mysterious island of Venice. Immediately, I was pulled in by the murder scene, a gruesome murder committed by someone who appears to be female. Then, I was connected to Anna's character. Anna is intelligent and resourceful but has been handed a difficult lot in life, her parents died when she was younger, she has had a miscarriage and her marriage has fallen apart. Venice was made into a sumptuous setting, I could easily image the aging but descendant buildings, the murky canals and small passageways. The suspense grew for me as Anna started digging up the past. Most interestingly, I began to question Anna's reliability as a narrator even as she began to uncover other's motives. Overall, a uniquely woven murder mystery with intricate twists and turns. The title describes this story wonderfully. Venice is a unique and sensuous city, and the descriptions in these pages allow the streets and canals to come across so vividly, it's easy to picture the surroundings and breathe in the moist air. Anna is trying to take a few days away from her life, especially from a nerve-wracking divorce. Instead of finding relaxation at her arrival in Venice, she's immediately picked up by the police on suspicions of murder. Although there's not enough evidence to hold her, the detective isn't giving up. Anna is left with no choice but to find the murderer on her own and clear her name, but the levels of intrigue prove more dangerous than she bargained for. Fans of Venice and murder mysteries are sure to enjoy diving into these pages. The author does an amazing job of bringing the streets, buildings, character and atmosphere of Venice to life. Being in Venice a few times myself, I was surprised at how realistic and vivid the city is portrayed. It's a delight to visit these pages just for these descriptions. As to the murder mystery, this is a tale with many layers and secrets. Anna has her own shadowed past, but it's nothing compared to those she meets in Venice. Each character is hiding something, and each story is intriguing. It makes it hard to put the book down. Although set in present day Venice, the mystery touches on Venice's past. This gives the tale a lovely richness and depth, but also makes it hard to guess who the real murderer might be. This is a slower paced read, which delves more into information and details than constant action. However, there are enough scenes to raise the tension, and the constant threat looming in the background keeps boredom away. It's a mystery as deep and beautiful as the city it's set in. The cover got me. And then the first few pages. I just was drawn into Venice. I felt apart of the adventure with Anna that wasn't so much of an adventure actually. A quick trip and a few days of rest and visiting friends turns into much more when an ex-lover tries to blackmail Anna with photo's taken behind closed doors. But before the can meet and Anna can retrieve the photo's he is murdered. As Anna runs for the scene she is noticed by by-standers and the police begin to suspect her. Hence her little short trips turns into an all race against time to figure out what is going on. Anna realizes that nasty photo's isn't all he's into. everyone seems to be hiding something. There is not a lack of suspects. I enjoyed the way the author wrote the story and described the Venice and the places that were a part of the story. I was on the edge of my seat and kind of wanting to be there. 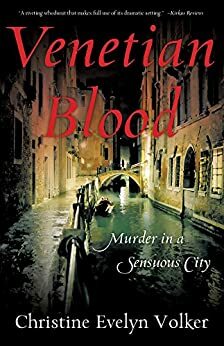 Venetian Blood was a great adventure thriller that will keep the reader turning the pages and trying to figure out just who is the murderer. I enjoyed reading Venetian Blood and look forward to reading more.